In earlier articles we looked at wind power, what it costs, what it does to the grid, and what to do when the wind is not blowing. Now a frequent comment – which conceals more than it reveals – is: “the wind always blows somewhere”. This is true – if you have lots of wind farms that are geographically dispersed you do average out your peaks and troughs, and you do also reduce the % change hour by hour. However, if you have 20% of your average power coming from wind, then on one given day it might be 60% of your requirements, yet the next day it might be 0.3%. This means that sometimes you are “winding back” your conventional generation, and sometimes you are “cranking up” your conventional generation – and much more in absolute terms than in a network of 98%+ conventional generation. The larger the penetration of wind energy the more problems this causes. The question has come up a few times without being answered – what is the impact on efficiency of conventional power generation? It’s clear that the impact depends on the penetration of wind. Very recent analysis is hard to find. It is important to understand that the key issue is not whether a system with a significant amount of wind capacity can be operated reliably, but rather to what extent the system operating costs are increased by the variability of the wind..
..Over the past two years, several investigations of these questions have been conducted by or on behalf of U.S. electric utilities. These studies addressed utility systems with different generating resource mixes and employed different analytical approaches. In aggregate, this work provides illuminating insights into the issue of wind’s impacts on overall electric system operating costs. PacifiCorp, a large utility in the northwestern United States, operates a system with a peak load of 8,300 MW that is expected to grow to 10,000 MW over the next decade. PacifiCorp recently completed an Integrated Resource Plan (IRP) that identified 1,400 MW (14%) of wind capacity over the next 10 years as part of the least-cost resource portfolio. A number of studies were performed to estimate the cost of wind integration on its system. The costs were categorized as incremental reserve or imbalance costs. 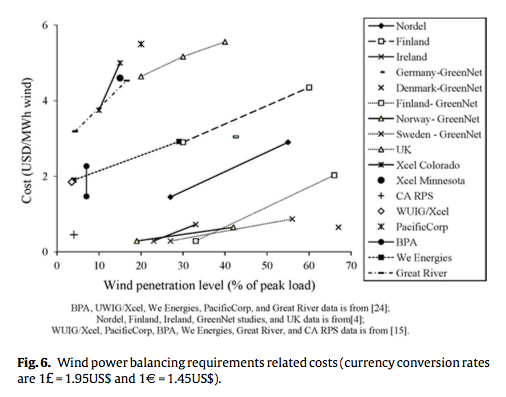 Incremental reserves included the cost associated with installation of additional operating reserves to maintain system reliability at higher levels of wind penetration, recognizing the incremental variability in system load imposed by the variability of wind plant output. Imbalance costs captured the incremental operating costs associated with different amounts of wind energy compared to the case without any wind energy. At wind penetration levels of 2,000 MW (20%) on the PacifiCorp system, the average integration costs were $5.50/MWh, consisting of an incremental reserve component of $2.50 and an imbalance cost of $3.00. The cost of additional regulating reserve was not considered. These costs are considered by PacifiCorp to be a reasonable approximation to the costs of integrating the wind capacity. Great River Energy (GRE) is a Generation and Transmission electric cooperative serving parts of Minnesota and northeast Wisconsin. It is primarily a thermal system in the Mid- Continent Area Power Pool (MAPP) region with a summer peak load in excess of 2300 MW, growing at 3%-4% per year.. As part of its planning process to meet this objective, GRE performed a study with Electrotek that examined adding 500 MW of wind in 100 MW increments between now and 2015. GRE operates with a fixed fleet of generation and uses a static scheduling process, so it did not decompose the problem into the three time periods commonly used in the analysis of ancillary-service costs in larger utilities. It also looked at providing the ancillary services required from its own resources, including a 600-MW combined-cycle unit, which was subsequently cancelled. GRE found ancillary- service costs of $3.19/MWh at 4.3% penetration and $4.53/MWh at 16.6% penetration. It is likely that the costs would have been higher without the combined-cycle unit and self-providing the ancillary services without economical intermediate resources. It appears that these studies are based on nameplate values (I didn’t find an explicit statement but the wording implies it and later references to the data agree). That’s a pretty big difference, because in GRE’s case it means that the “16.6%” would actually be something like “5-6% of average electricity production from wind”. The 16.6% would be when the wind farms were operating at their maximum. Smith et al. reported that the existing case studies have explored wind capacity penetrations of up to 20–30% of system peak and have found that the primary considerations are economic, not physical . On the cost side, at wind penetrations of up to 20% of system peak demand, it has been found that system operating cost increases arising from wind variability and uncertainty amounted to about 10% or less of the wholesale value of the wind energy . This finding will need to be reexamined as the results of higher-wind-penetration studies—in the range of 25% to 30% of peak balancing-area load—become available. However, achieving such penetrations is likely to require one or two decades. The reference  here is Wind plant integration, E DeMeo et al, IEEE Power Energy Mag (2005) which has the same data as the NREL study, not surprising as two of the authors are the same. The study that produced these particular values (and some others) is H. Holttinen et al 2009. This is from 2009 and what appears to be the same data is in a paper in Wind Energy (2011). However, the studies that produced their data: Finland and Nordic – PhD by Holtinnen 2004; Sweden – paper by U Axelsson et al from 2005; Ireland – 2004 study; UK – paper by Strbac et al from 2007; Germany – Dena Grid study from 2005; Minnesota – paper for Minnesota Public Utilities Commission from 2006; and California – paper by Porter et al from 2007. From the cost estimates presented in the investigated studies it follows that at wind penetrations of up to 20 % of gross demand (energy), system operating cost increases arising from wind variability and uncertainty amounted to about 1–4 €/MWh of wind power produced (Fig. 5). This is 10 % or less of the wholesale value of the wind energy. The actual impact of adding wind generation in different balancing areas can vary depending on local factors. Important factors identified to reduce integration costs are aggregating wind plant output over large geographical regions, larger balancing areas, and utilizing shorter gate closure times with accurate forecast systems and sub-hourly schedule changes. The interconnection capacity to neighbouring systems is often significant. For the balancing costs, it is then essential to note in the study setup whether the interconnection capacity can be used for balancing purposes or not. A general conclusion is that if interconnection capacity is allowed to be used also for balancing purposes, then the balancing costs are lower compared to the case where they are not allowed to be used. The two points for Greennet Germany at the same wind penetration level reflect that balancing costs increase when neighbouring countries get more wind (the same applies for Greennet Denmark). For a small part of an interconnected system, a wind integration study stating a high penetration level can also be misleading if the wind penetration in neighbouring areas is low and interconnection capacity plays a major part in integration. In Denmark the TSO has estimated the impacts of increasing the wind penetration level from 20 % to 50 % (of gross demand) and concluded that further large scale integration of wind power calls for exploiting both, domestic flexibility and international power markets with measures on the market side, production side, transmission side and demand side ( and ). This kind of implies there are big issues, but the documentation is locked away in conference proceedings. Surely some published papers have come out of this important question so I will continue to dig.. Transmission cost is the extra cost in the transmission system when wind power is integrated. Either all extra costs are allocated to wind power, or only part of the extra costs are allocated to wind power – grid reinforcements and new transmission lines often benefit also other consumers or producers and can be used for many purposes, such as increase of reliability and/or increased trading. The cost of grid reinforcements due to wind power is therefore very dependent on where the wind power plants are located relative to load and on the grid infrastructure, and one must expect numbers to vary from country to country. Grid reinforcement costs are by nature dependent on the existing grid. The costs vary with time and are dependent on when the generator is connected. After building some lines, often several generators can be connected before new reinforcement needs occur. After a certain time, new lines, substations or something else is needed. The grid reinforcement costs are not continuous; there can be single very high cost reinforcements. Using higher voltages generally results in lower costs per MW transported but this also means that there are even higher increments of capacity and grid costs. The same wind power plant, connected at different times, may therefore lead to different grid reinforcement costs. For transmission planning, the most cost effective solution in cases that require considerable grid reinforcements would be to build the transmission network for the final planned amount of wind power in the network – instead of having to upgrade transmission lines in several phases. It seems like everyone studying wind power believes the additional costs incurred as a result of having to ramp up and down conventional power systems are relatively low – typically less than 0.5c/KWh for 20% penetration. Likewise, everyone agrees that there is a real cost to be paid. The cost for 50% penetration is unclear, even if it is feasible. There doesn’t seem to be any real world data for high wind penetrations, which is not surprising as Germany, a wind power leader, has only about 10% of (annual average) power coming from wind, and Denmark is effectively part of a much larger grid (by virtue of interconnection). Whether or not the current estimates factor in the lifetime impact on power stations (due to lots more heating and cooling causing more stressing of various parts of the system) is something that might only be found by the real world experiment of doing it for a couple of decades. [Note that many statements and press releases on the subject of wind do not clarify whether they are talking about “peak”, i.e., nameplate, or “average”, i.e. the nameplate x capacity factor – it is essential to clarify this before putting any weight on the claim]. In adition to you the articles you present I linked a few times to a Dutch wind study in previous posts that has -among other things- modelled this as well. The results are shown on page 86. Efficiency curves for several conventional generation types are shown on page 56. It also shows simulation results with and without interconnections up to 12 GW nameplate wind (off-peak usage in this study is assumed ~12 GW). See Figure 2.5: Daily wind speed pattern for the measurement locations and for interpolated sites of the Dutch wind study. Wind speeds below and above the cut-in and cut-out values of wind turbines must be set to zero since they are of no use in energy production calculations. In not doing so the intermittence of the energy production will be strongly masked. In essence the calculations should be done for each cut-in/cut-out combination. Which has been done. See the discussion in chapter 2.4. It has been done on model data, not on the original data. The average daily wind speed tend to be too high by including hourly data ouside the cut-in/cut-out range. The same period data for De Bilt gives 3431 zero production hours after zeroing data outside the cut-in/cut-out range. The original data has 118 zero production hours. The original data contains 118 zero wind speed values. Actually here in Germany it appears that the merit order effect of wind and solar at this point (at around 10% each) by far overcompensates for any inefficency losses due to increased ramping of thermal power plants. It isn’t sufficient to look at the change of thermal plants capacity factor due to intermittents, but you have to consider that the structure of the power plant fleet will change, too. -Our lignite plants still run very close to their maximum capacity factor. -NatGas plants have become mostly uneconomic, save for industrial/residential cogeneration. -Hard coal plants have taken over most of the load following from the gas plants. on October 8, 2015 at 2:58 pm | Reply Mike M.
I seems to me that there are some important additional factors that are needed if one is to interpret the numbers. I think that there are two issues with respect to the balancing costs: the capital cost of reserve conventional capacity (i.e., the resources needed for when the wind does not blow) and additional operating costs associated with the need to deal with increased variability. These should be reported separately with a clear statement of assumptions made provided for each. For capital costs, are the calculations based on the cost of providing new backup resources or on the cost of existing resources? The latter will be much lower since much of the plant was built at a time when construction costs were lower and some is likely already paid for. Either can be used, but one must be consistent. If you want to use conventional levelized cost calculations, then you are comparing wind to new conventional plant. In that case the balancing cost must also be based on new construction. It looks to me like the calculations you discuss are based on using existing resources. I deduce that from the costs being similar to those obtained by Gross. The result is then misleading, since the same method of calculation would lead to a much lower cost of conventional power than usually reported in levelized cost calculations. Wind might increase the operating costs per kWh for the conventional power by forcing the displacement of lower marginal cost power (nuclear, coal) with higher marginal cost power (gas peaker plants) and by reducing efficiency due to the need to operate more spinning reserve and to ramp that reserve more rapidly. Without a breakdown, how can one interpret the numbers? I guess I have to go read the original papers for myself. Thank you for providing them. The above should be interpreted as commentary, not complaint. The costs are definitely the increased running costs of the plants. This is very clear in the papers, sorry I didn’t explain it better. The question here is: as we increase the penetration of wind into the electricity generation network, and we have to ramp existing plants up and down more and faster to cope, what is the estimate of increased operating costs. No new capital costs have been considered. This is simply around the idea that currently wind is displacing conventional generation. There is more detail in some of the papers. Holtinnen’s paper is free, very accessible and some good detail, plus bonus information. The 2009 document is over 200 pages and I have not been through the whole document yet, but looks like a very good resource. Of interest – with high utilisation, even a very remote location might be economic. Maintenance would seem an obvious challenge. SOD: The studies you cite discuss the added cost of wind. To complete a cost-benefit analysis, one needs to know how much emission of CO2 is actually reduced (after accounting for reserve requirements, etc. ), calculate the cost per ton of CO2 not emitted, and compare the result with estimates of the social cost of carbon. Does anyone take their analysis to this endpoint? Will you? I have no idea of the magnitude or even the sign of the social cost of carbon emissions. I take published estimates with tons of salt. See, for example, the Stern Report. IMO, the exercise you propose is pointless. I haven’t found calculation of reduction in CO2 emissions. I would like to. ..Roughly speaking, we see gas costs for our two reference prices (taking into account plant efficiency) of $19/MWh (6.4 x $3) and $64/MWh (6.4 x $10)..
And look at the efficiency reduction cost in said gas plants due to wind intermittency of $5/MWh..
.. It seems as if displacing 1 MWh of gas-produced electricity with wind, instead of saving all 100% of the CO2 from burning that 1 MWh, we save something roughly between 75% and 90%. That’s a very approximate “back of the envelope” estimate from the cost calculations. ..and compare the result with estimates of the social cost of carbon. Does anyone take their analysis to this endpoint? Will you? I have no idea about the estimates of the social cost of carbon. It seems like an exercise that can produce any number you want. Something between zero and a $ value that represents the end of days. I read The Signal and the Noise: The Art and Science of Prediction by Nate Silver a little while ago. I highly recommend it – lots about forecasting in different disciplines – and very readable. You can see the fabulous success of economists in predicting next year’s economic growth (when it changes from the average of the last few years). – where we see the consensus 90% forecast range of GDP growth over 18 years was outside this fully 1/3 of the time. And he notes a further study going back to 1968 where the results are outside the “90% range” 1/2 of the time. So one year out, economists are massively over-confident on their predictions of GDP growth. Forecasting is very difficult, especially when it involves the future. My experience is that business, politicians and voters all have a bias towards accepting over-confident prediction rather than facing up to the reality that we have little idea. Apparently facing reality = capitulation. How can we work with no forecast? Instead “we will adopt scientific forecasting.” Much better to invent a reality and then ignore our failures. Next year, repeat. Plenty for psychologists, but not much for reality-based calculations.. so I can’t answer this part of your question. SOD: All I have read about the EPA’s new value for the Social Cost of Carbon is in the first link. The author, Cass Sunstein, was a widely respected law professor before overseeing all regulatory rule making for the Obama administration. If you are interested, the other links are to the EPA’s technical documents. According to Sunstein, the most contentious issues were the discount rate and whether world-wide harm or just US harm should be counted. If we had a binding world-wide treaty limiting emission (that could be enforced) our mitigation costs would be “paying” to reduction of world-wide damage. In the absence of such a treaty (or a large regional treaty), the EPA can’t guarantee that Americans will be “buying” a worldwide reduction in emissions via the EPAs costly rule making. Utilities are making most of the investment in sustainable energy. Local Public Utility Commissions guarantee them a profit assume a cost of capital that is much higher than the EPA’s (3%?) The same discount rate should be applied to both return on investment and return on reduced social cost of carbon. The government can borrow at a lower rate than utilities, but then you need to account for the lower efficient of governments than the private sector. See Solyndra. Would you like the government to borrow and invest $100M in projects they choose and control, while charging 2-3% for the capital. Or, would you like the private sector invest the same amount and charge a 5-7% return on capital? A problem with doing an analysis like this is that it may well be premature. One would think that wind and solar need to be significantly overbuilt to accommodate large buffering storage systems. This is such early days that standardized storage strategies are still in the development or discussion stages. But once the market penetration of wind and solar becomes a plurality or majority, why make plans to burn carbon at all? Better might be pumping water uphill, or electrolysing water for hydrogen fuel. Hydrogen is interesting because it could be used in so many ways, which might make up for the inefficiency. But inefficiency may not be an issue whatsoever with an overabundance of power. And we’re back to the dead horse known as the Hydrogen Economy. The assumption then was that nuclear power would be so inexpensive that it wouldn’t need to be metered. Then the massive inefficiency of water electrolysis wouldn’t matter. That assumption was false then, it’s false now and will be false for the forseeable future. And that’s not to mention the difficulty of dealing with hydrogen. on October 10, 2015 at 10:09 pm Mike M.
I agree that the Hydrogen Economy will never happen. An intriguing possible use for excess power would be to produce H2 then convert it to liquid hydrocarbon fuel via the Fischer-Tropsch process using biomass as the source of carbon. Since most of the energy would come from the H2, the amount of biomass needed would be much smaller than in most bio-energy schemes. And very low quality biomass could be used, so no direct competition with food. Of course, for this to really make sense a breakthrough in electrode technology would be needed. And a relatively steady source of power would be needed so as to make decent use of the large capital investment. So it would make a lot more sense as a complement to nuclear, rather than wind or solar. Even better would be to combine the H2 with CO2 captured from the atmosphere to make liquid fuel. The capture part is probably pie in the sky. You need a lot more than different electrodes. The conversion itself is inefficient, and whatever process the hydrogen is used in is also inefficient. The net efficiency for the process (both ways) is very poor. Like DeWitt says, it’s a long dead horse. Energy efficiency and electrical energy storage both need improvement, but they are at least plausible. ..to accommodate large buffering storage systems.. In the fictional chapters of renewable energy, the future brings affordable large storage systems. In the real world of renewable energy, the future has no affordable large storage systems. Unless we have a radical technology breakthrough (i.e. not an evolution of current systems). The fictional storage systems are often combined with mythical “demand management”, which means people come home from work and don’t turn on the heating, don’t start cooking, and don’t turn on their TVs. Sometimes demand management means instead of the mythical “sitting in the cold and dark, eating tinned tuna”, that people will be purchasing these fictional storage systems to allow them to turn on the electricity. This presents a major problem, only solved with semi-fictional biomass burning (i.e., a dispatchable electricity generation source). What do you mean by :”unaffordable”? The scale of fossil fuel spending is gigantic – $1.5 tr per year in the U.S. alone. A trillion dollars is a lot of money if spent wisely. Also, the penetration of wind and solar into the total energy market are very small so far, yet we already are seeing negative pricing occasionally (excess energy). Considering that renewables have to be overbuilt anyway, it would appear that there would be plenty of extra juice available to do even inefficient things, like electrolyze water, to build up a surplus on the many good days, in order to maintain baseload on the much fewer days when it might be needed. The inefficiency of even electrolysis is completely irrelevant IF it reliably provides the capacity we need. Efficiency matters not when solar and wind are in hyperabundance. Which they will be for the next billion years or so. The scale of fossil fuel spending is gigantic – $1.5 tr per year in the U.S. alone. In 2011, US electricity generation was 4.5M GWh. For reference, almost 70% of this was from fossil fuels (the balance being from nuclear, 20%, and renewables, mostly hydro at 7%). That makes about 3.2M GWh from fossil fuels. [Data from Electricity generation from renewables in the United States: Resource potential, current usage, technical status, challenges, strategies, policies, and future directions, Atif Osmani et al, Renewable and Sustainable Energy Reviews 2013]. $1.5TR to produce 3.2M GWh (=3.2×1012 kWh) = $0.47 cost per kWh – just on fuel. I think the wholesale price of electricity is a few cents per kWh, so it’s hard to see how $1.5TR could be spent on fuel. Maybe you can check your data source and comment again. (For reference, US GDP is about $18TR). What do you mean by :”unaffordable”? How much storage is needed? Depends on a number of factors, but let’s say we need 1 week. That’s storage for 86,000 GWh or 86BN kWh. I haven’t read up on storage costs (other commenters here have some data), but one NREL paper has about $1,000 per kWh. It doesn’t last for ever – factors like amount of charge/discharge and number of cycles, along with temperature are important factors. So using that cost we get $86TR. Of course there are all kinds of claims about what storage will cost in the future. But I’m trying to keep this blog reality-based..
You might be a bit high on your storage cost, but only a bit, probably less than a factor of three. The 10kWh Tesla power wall is supposed to sell for $3,500. Of course that doesn’t include the electronics. For a home installation, the electronics would be on the order of $5,000. There would certainly be economies of scale for the electronics, however, but not much for the batteries. With that much capacity, it’s likely the batteries would last a long time as you wouldn’t do a full discharge very often. on October 12, 2015 at 4:35 pm Mike M.
I think that is rather high. It looks like 100% of demand for a week. Wind can give periods of low production for a week, but not zero production, so I would guess that the actual storage needed would be smaller by a factor of 2 or 3. If society is willing to keep peaker plants ready for the occasional emergency (rather than seeking the purity of 100% renewable) one could likely reduce storage by another factor of 2 or 3. So maybe a day of storage would be needed. That is still an order of magnitude more than what would be needed to even out, or shift, diurnal variations in demand. Capital investment for nuclear or renewables is in the range of $5000 to $10000 per kW (average power, not peak). If storage costs $1000 per kWh, then adding two hours of storage would increase capital cost by $2000 per kW; not cheap, but not crazy expensive. Adding 24 hours of storage would cost $24000 per kW, far exceeding the cost of producing the power. Realistically, we likely won’t see large scale electrochemical storage until someone develops a low cost scheme with the stability of an Edison cell (Ni-Fe) and the capacity of Li ion. Probably not impossible, but I am not holding my breath. I would say the probability is vanishingly small. The reason lithium ion cells have high capacity is because they aren’t thermodynamically stable. For that matter, neither is a classic lead acid battery. It’s possible to build a much more stable lead/acid battery. You deposit the lead dioxide, PbO2, onto a platinum electrode from a perchloric acid solution. That way, the PbO2 isn’t in contact with an oxidizable metal like lead and plate rotting isn’t a factor. They used those batteries in torpedo warheads, but they aren’t exactly cheap or high capacity. Maybe the carbon nanotube thing will work but, as you say, I’m not holding my breath. I’ve worked with lead dioxide deposited on graphite electrodes and they aren’t all that stable either. PbO2 can oxidize water to oxygen. It’s just a very slow reaction. As has been said elsewhere, batteries are a triumph of kinetics over thermodynamics. The “one week of storage” might sound high, but it depends on the proposed design. Even with a Maine-Florida east coast offshore wind supergrid we can see a week of very low production. In that example the output averaged about 0.2. So let’s say instead of 7 days, we need 5 days. The point is – for the many people carelessly throwing around comments like “just add storage” – you need a design that has been subject to a time-series analysis. With such an analysis you can come up with a storage number based on the loss of load probability you want to accept. Most people don’t realize how expensive storage is. Or how expensive transmission is. Being able to place generation next to load centers and being able to turn generation on and off when you want is a massive benefit. That’s one way to phrase it. I think it is much more useful to look at storage in batteries not just in terms of capital cost, but as a “consumable”, due to very limited lifetime. A good quality lead acid battery, not discharged too deeply (say, 50%), and very carefully controlled during charge, might give you 2000 cycles, and cost about $700 per (net) KWH of capacity. So the continuing replacement cost is 700/2000 = $0.35 per KWH…… plus capex! More modern batteries may be a bit better, but nearly an order of magnitude increase in battery life, or an order of magnitude reduction in replacement cost, is needed to make storage financially practical. I don’t see this kind of improvement on the horizon, no matter what Mr Musk may claim. I hope that I am mistaken, but I doubt I am. on October 14, 2015 at 12:56 am Mike M.
I am inclined to agree with you. But Tesla is apparently claiming $3000 for a 7 kWh “daily cycle” battery that is good for 5000 cycles with round trip efficiency of 92%. Surprising numbers. Even so, treating it as a consumable gives about $0.09/kWh, plus capex on the battery and inverter. So it is not really practical yet. But maybe not as far away as we think. on October 14, 2015 at 1:01 am Mike M.
if real, the Musk numbers make stand-alone solar far cheaper than grid power in many places. (Eg, in the Bahamas grid power is diesel and crazy expensive). But projections of performance and actual performance are often as divergent as climate model projections of warming and measured warming. I remain skeptical of both. Thanks for yet another informative and carefully reasoned analysis. An appropriate adjective for this series might be ‘tour de force’. I am very impressed. But I have one question: where do you find the time to do all of this? (serious question) Are you retired? Independently wealthy? Found a way to live without sleep? No, no and I just squeeze it in somehow. Figuring stuff out properly is more interesting than many other activities. I think there was a Scientific American article that said learning was like opium for some people. Saves on those costly drugs bills.